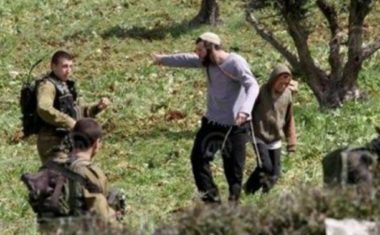 A group of illegal Israeli colonist settlers invaded, on Tuesday morning, Palestinian agricultural lands in Bruqin village, west of Salfit in northeastern West Bank, and uprooted 39 olive and almond trees owned by a Palestinian farmer. Bashir Salama, the head of Bruqin Local Council, said the Israeli assailants invaded lands, owned by a local farmer identified as Jamal Othman Salama, before cutting and uprooting 39 olive and almond trees. The invaded Palestinian lands are near the illegal Brokhin colony, close to bypass road #446. The farmer, Jamal Salama, said that, in 2011, the Israeli colonizers cut and burnt 200 olive trees, and uprooted 40 olive saplings in 2017, to install water pipelines for their illegal colonies, built on private Palestinian lands. It is worth mentioning that the illegal colonizers have cut, uprooted and burnt nearly 5000 trees, mainly olive trees, owned by several farmers, since the beginning of this year.